Chuck Aaron flying a loop in the modified Red Bull MBB Bo105 in Atlantic City, N.J.
It’s a chicken-and-egg sort of question: did helicopter pilot Chuck Aaron make Red Bull’s aerobatic MBB Bo105 famous or did Red Bull make Chuck Aaron famous for his helicopter aerobatics? The longer answer must include Aaron’s lifelong interest in flying, more than 20,000 accident-free flight hours (about 18,500 in some 33 helicopter models), his perseverance and attention to detail, the imagination and marketing prowess of the founder a successful energy drink company, a once-in-a-lifetime opportunity and now the bestowal of HAI’s 2014 Pilot of the Year Award. Aaron received the Art Scholl Award in 2009, was accepted as a full member in the Society of Experimental Test Pilots in 2011 and was inducted into the Living Legends of Aviation in 2013. Aaron’s official title with Red Bull is chief pilot and, as an A&P mechanic, director of maintenance of Red Bull North America. His thang with Red Bull is flying loops, rolls, vertical climbs, split-S’s, Cuban Eights, Immelmans, a modified Lomcevak (called a “Chuckcevak”) and other aerobatic maneuvers in a Bo105 that he modified and received FAA approval to fly. He is, in fact, the only pilot in the U.S. licensed to fly aerobatics in a helicopter. “I’ve had plenty of emergencies, but I’ve never been hurt and never bent an aircraft,” Aaron told AIN. He is also president of his own company, West Lake Village, Calif.-based FX Helicopters, which he founded in 1997. Regular Heli-Expo attendees may remember a Bell TAH1F Cobra that FX Helicopters exhibited at the event several times over the years. Mateschitz, who is also dual-rated in airplanes and helicopters, told Aaron to do it; Red Bull would pay for everything. It took Aaron a year and a half to find a suitable Bo105, modify it and get it approved for aerobatic flight by the FAA. He received his FAA aerobatic approval in 2006 and the shows began. Red Bull now has a second Bo105, which is based together with more than 30 other the Flying Bulls aircraft at Hangar 7 on Salzburg Airport, Austria. The MBB Bo105, with its hinge-less, rigid articulating rotor, titanium rotor head, composite rotor blades and “full controllability even at negative-g maneuvers” (according to its technical description), has built-in aerobatic capability. Some test and military pilots have flown limited aerobatics in the model. According to a blog in the Flying Bulls section of the Hangar 7 website (http://www.hangar-7.com/en/the-flying-bulls/bo105-cb/), Siegfried “Blacky” Schwarz learned about a former German Air Force pilot who teaches students how to loop the helicopter. “After some research, we–that is Hannes Arch, Chuck Aaron and I–invited this ex-officer, Rainer Wilke, to Los Angeles,” Schwarz writes. “We were not completely open-minded, I must admit, because we had prepared a really long checklist of questions to ask. We were, however, to be surprised. [Wilke] explained maneuvers to us, which until then we had believed to be impossible.” Wilke later became Scharwz’s and Aaron’s aerobatic instructor. 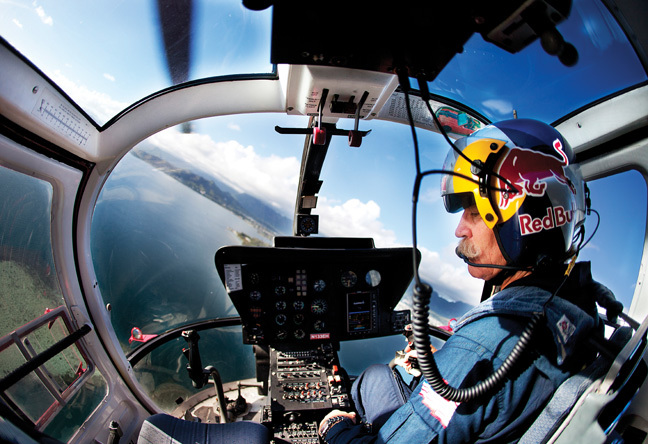 Scharwz and Wilke now fly aerobatics in the only other Red Bull Bo105, the one based in Salzburg. “They’re actually better than me,” Aaron said. He also credits Kevin Bredenbeck, chief test pilot of Sikorsky, and Rich Lee, Boeing chief pilot assigned to the Apache, for their advice about aerobatics in helicopters. While the details of the modifications to the Bo105 are proprietary, Aaron said the two main changes involved “beefing up the rotating components to make them stronger” and moving the center of gravity forward, by adding weight to the nose. “We did this so that the nose will normally want to come down, if anything goes wrong, when I’m flying upside down,” he said. Aaron has been flying 20 to 25 airshows a year, all on weekends from March to November. This year at his request Red Bull reduced the shows to 14. “I’m very grateful for this,” he said. “We fly the aircraft everywhere we go. So, now usually my son [Charles] ferries the aircraft to the show site, and I fly in commercially to do the show.” (Charles Aaron, a U.S. Air Force veteran, is a commercial helicopter pilot and instructor.) Chuck Aaron also does other work for Red Bull, including giving aerobatic demonstration rides to celebrities and others, including Harrison Ford, Tom Cruise, golfer Camilo Villegas and HAI president Matt Zuccaro. “My father has been my mentor and hero and is an awesome pilot,” said Chuck Aaron. “I’m just trying to catch up with him. He started off as a barnstormer in 1937 in West Texas. When Canada entered World War II in 1939, he went there, was made a flight instructor and first lieutenant in the RCAF. After Pearl Harbor, he flew back to Michigan, got a presidential commission in the Army Air Corps and was made a captain. He flew heavy iron the whole time and retired as a full colonel after 30 years.” Now 96, the elder Aaron lives in Orlando, Fla.
During his lifetime of flying helicopters, Aaron has done stunt flying for movies and television, flown traffic helicopters and crop dusting and towed banners over beaches.